The New York Times published a powerfully worded op-ed on Sunday, blasting Trump for his pettiness in the wake of the death of Republican Senator John McCain on Saturday. Titled: “As a Nation Mourns McCain, Trump Is Conspicuously Absent,” the article contrasted Trump’s pettiness to the actions of past presidents from George Washington, the nation’s first president, through Barack Obama, Trump’s immediate predecessor. 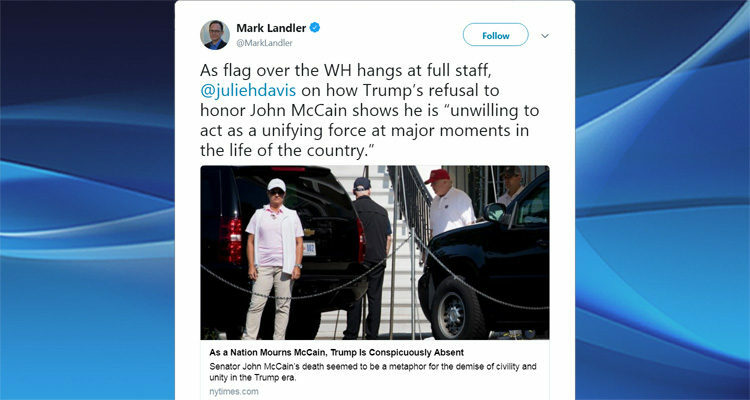 “As leaders of both political parties and foreign dignitaries publicly mourned John McCain on Sunday, President Trump conspicuously avoided a national moment of tribute to a senator whose death seemed to be its own metaphor for the demise of civility and unity in the Trump era,” the article began. The president did not make even the most cursory public show of respect on Sunday for Mr. McCain, against whom he had continued to indulge a personal grievance even as it was apparent that the Arizona Republican was losing his battle with brain cancer. The president spent much of the day golfing and attacking his usual enemies on Twitter. But more than just the culmination of a political feud, the specter of Mr. Trump’s highly visible absence from Mr. McCain’s funeral on Saturday morning at Washington National Cathedral underscored the degree to which the president has veered from the norms of his office, unwilling to act as a unifying force at major moments in the life of the country. The New York Times article went on to cite several individuals speaking out about Trump’s absence as a unifying leader. Everyone, including him, is more comfortable with him not there, and that’s a striking thing on its own, given that he is the president of the United States, and this was a sitting senator who is respected by both sides. For better or worse, he’s outside what would have been the bipartisan boundaries, you might say, of American presidents. For most of American history, politics stopped when you had the death of a national leader, and the fact that it hasn’t says an awful lot about the current state of our country and our politics, and in particular about Donald Trump. What you’d want to see is a president acting as graciously and as large-mindedly as possible, in the John McCain spirit, but there is no sign of that yet. “John McCain, in death, is performing the unifying function that the incumbent president is congenitally incapable of performing,” Meacham added. Turning to events of today, so far, flags at the White House were back at full mast – after it took until Sunday for them to be lowered to half mast to honor McCain.